Changing mats are an absolute must with a baby. Even when I see those disposable covers on the changing tables I cringe. There is just something comforting about having my own mat that I know has been safely stored with me. I am not a total germaphobe, just with certain things. Restrooms and cleanliness during diaper changes are two of those things. So many unimaginable germs roaming through! Have you noticed how quickly your child will outgrow the changing mats you have? I noticed it really quickly. They're made to store in tight spots but will eventually leave parts of your babe uncovered. 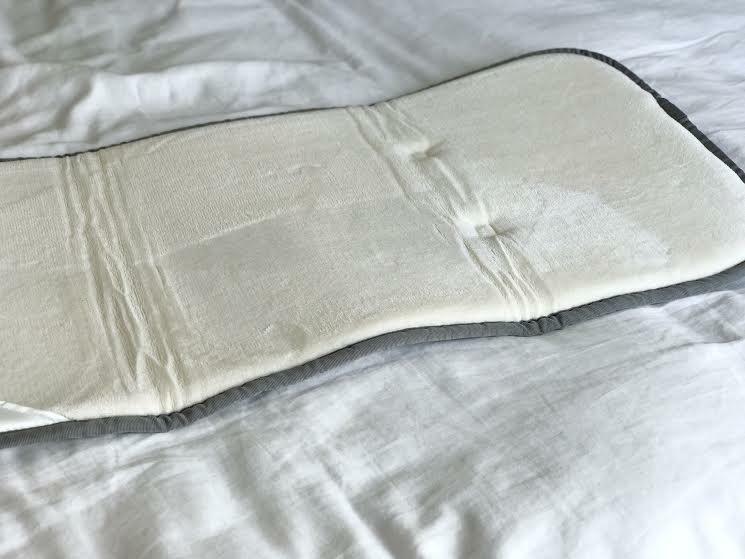 Along with size most mats are only a pad made out of vinyl meant to serve as only a layer between your baby and those hard and uncomfortable changing areas. 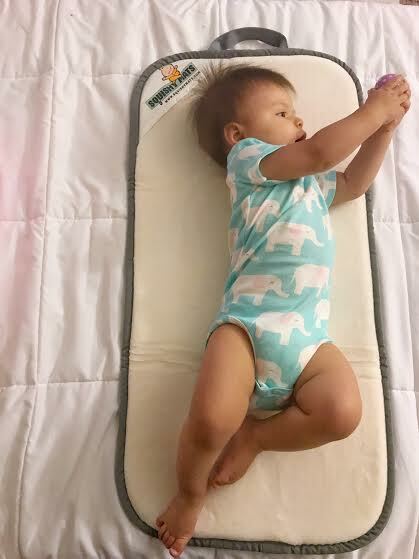 Squishy Mats has made a mat that is not only large enough to fit your growing baby, but made for comfort. What is it made of you ask? MEMORY FOAM! Let me tell you a little bit about Squishy Mats. Squishy Mats make memory foam mats for your babies. They carry a changing mat, and two different sized play mats designed to provide comfort while your kiddos play. Our particular mat is the travel changing pad. So what is so cool about this mat? Well for starters it is made with almost an inch of memory foam so it is super soft and comfortable for your little ones. You can use it for play time with your newborn babies as well. It is shut with velcro and has a handle making it easy to travel with. Now let's break down my thoughts. Overall I found this mat to be a really cool innovative baby item. Although memory foam is definitely a luxury feature, with a newborn babe I think it would be great for their soft little heads. I love the size but found it difficult to put in my diaper bag because of it. So I guess the size is a positive and a negative aspect. For day to day use you could use it on top of your changing table at home for extra support and comfort. I have mine handy in the car ready to go whenever we need to do one of those in the car diaper changes. If you would like to purchase your own I have a special savings pass for you! 15% !!!! Save 15% Off with code "USFAMILY" on all sized Squishy Mats. 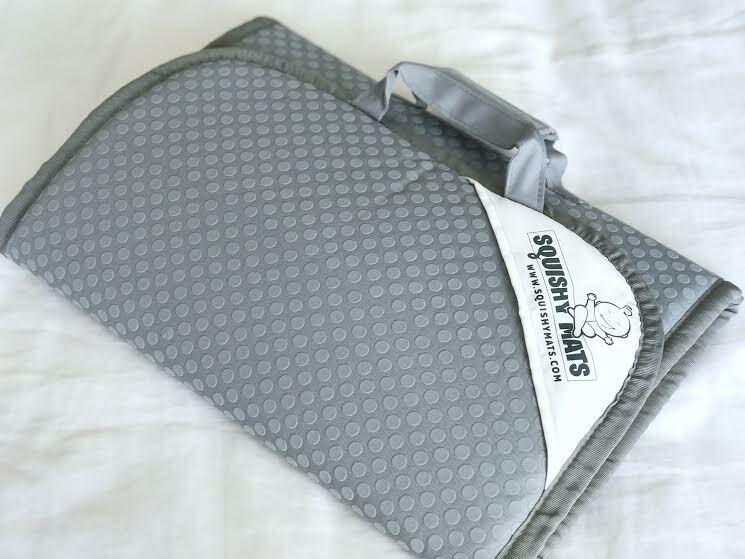 The world's first baby memory foam mat that folds for quick storage and transport. Get yours HERE.